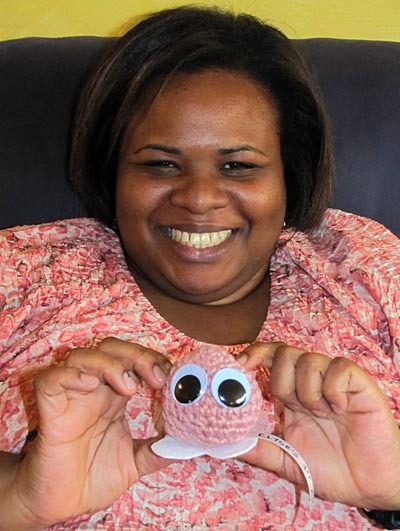 Saturday my friend came by for her crochet lesson and gave her first ami a try. It took a while and the whole counting thing was a bit of a problem due to my son constantly talking, but her Googly Thought came out GREAT! She’s going to try wool next so she can make a fuzzy brushed one also. Actually, her plan as of Saturday was to make one in every color. I’ll let you know how that develops. Congratulations Elyse, you made your first ami! This is the first square I freestyled. 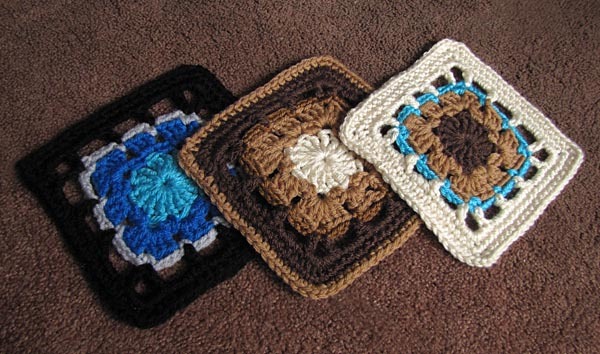 I was creating some squares for Share A Square, a bunch of people making squares that will magically turn into blankets for children with cancer, and realized it would be fun to start freestyling and to see where it took me. 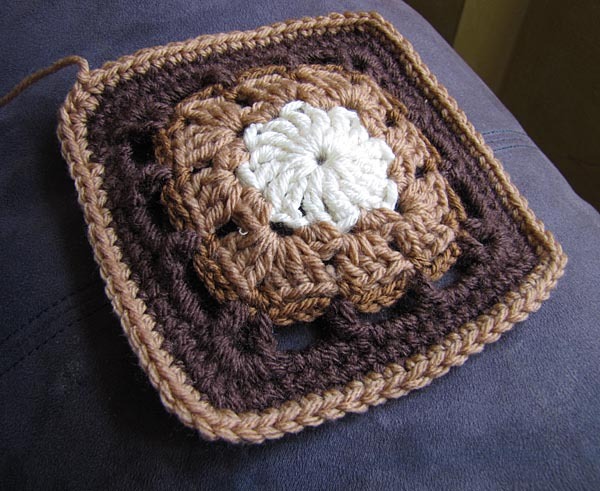 With a hook, yarn, and pattern free, I came up with the Window Pane Square. This is the pattern. 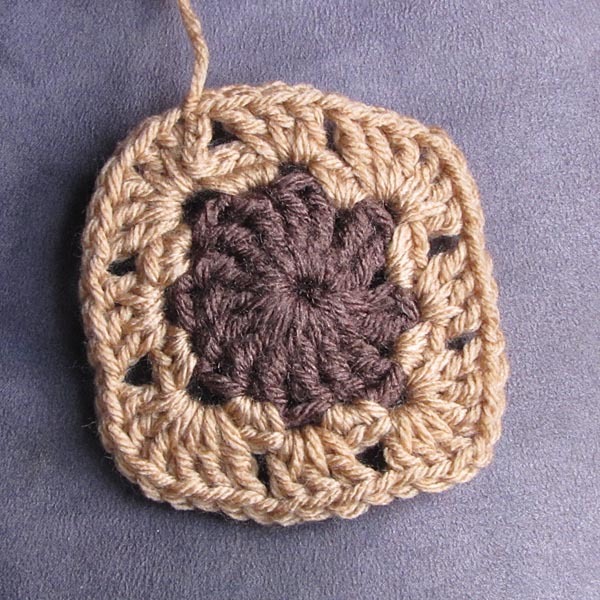 Using an H hook and worsted weight yarn this created a 6 inch square. I used a combination of Red Heart Soft and Red Heart Super Saver. 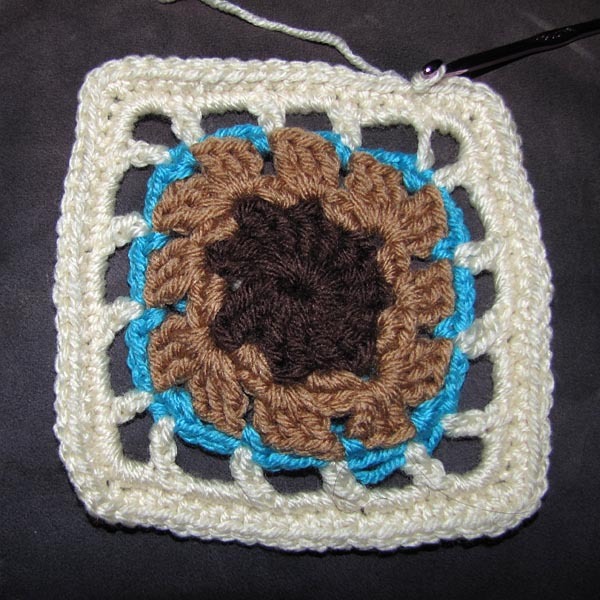 If you need to make the square slightly larger, add more rows of SC or HDC as border rows. 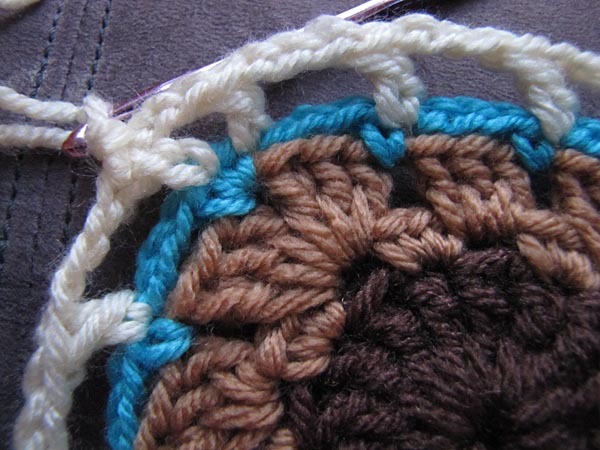 Notes: You will join each row with a slip stitch and will not turn. 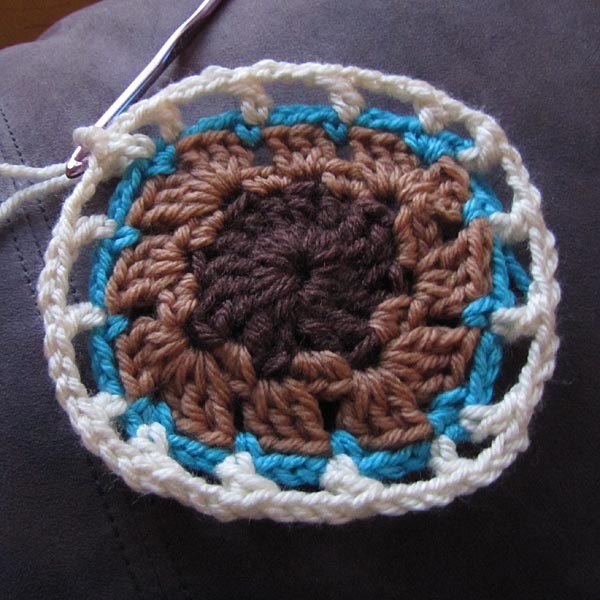 Slip stitch to corner or finish off and add new yarn color at the corner at the end of each row. Repeat between () or  where indicated. 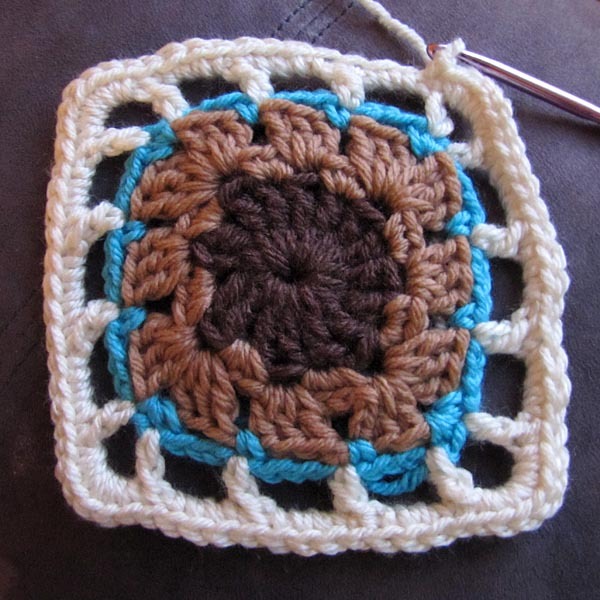 Repeat Row 8 if you need to make the square a little larger. 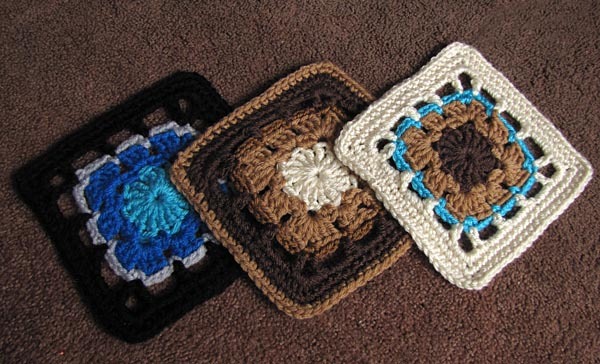 For this year’s blankets, all squares need to be submitted by tomorrow, March 10, 2011, but they will start accepting squares for next year in August 2011. 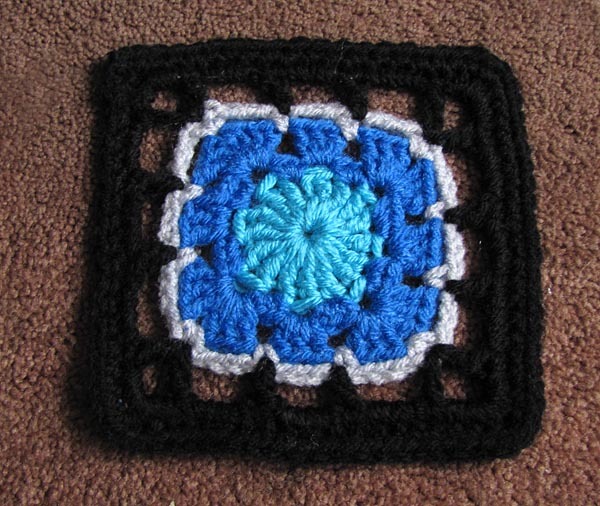 You can check the Ravelry group Share a Square 2010 for updates and to see if squares are being accepted yet. Yea! Celebrate! 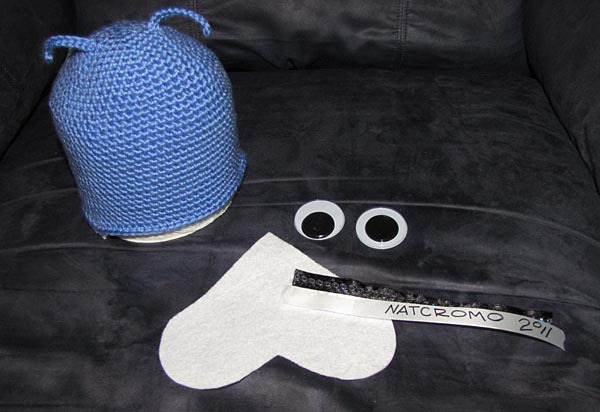 It’s NATCROMO! 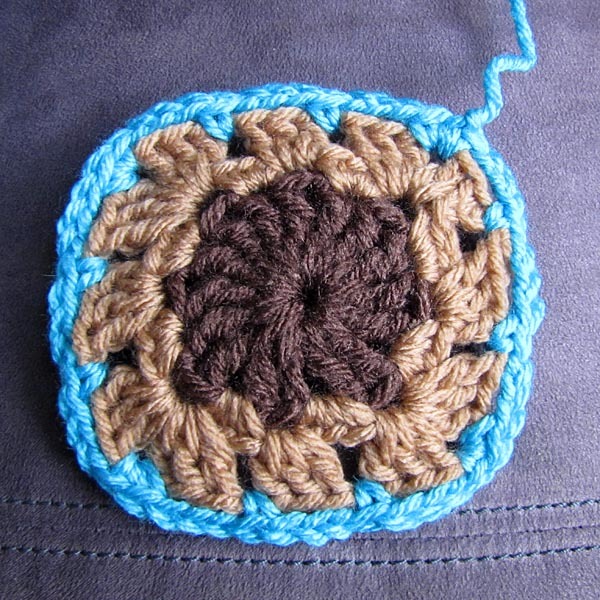 That’s National Crochet Month in case you hadn’t heard and there’s a party going on over at Ravelry to celebrate. 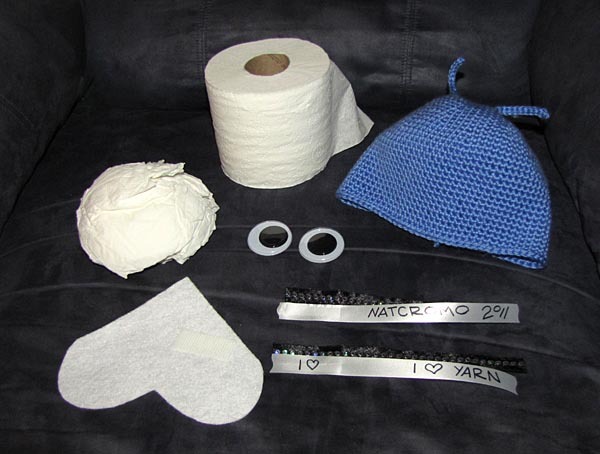 A Scavenger Hunt is just one of the party games and for 17 points I made a toilet paper cozy, but not just any tp cozy, a Googly Thought TP Cozy. Worsted weight yarn 150 yards is a very rough estimate. Cotton or acrylic for a “regular” one. 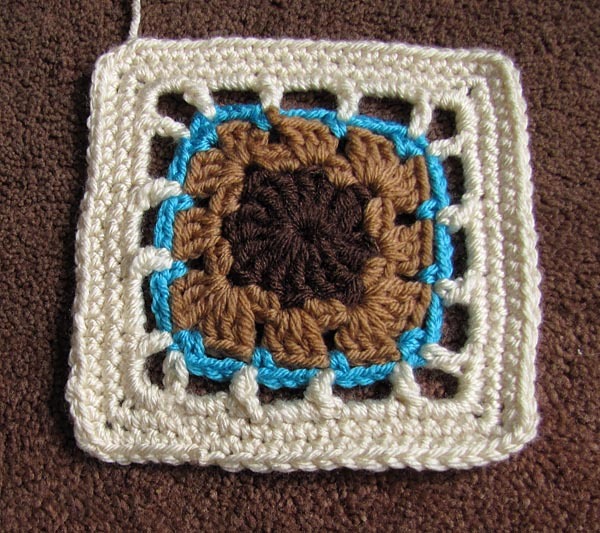 The one pictured uses Caron Simply Soft 100% Acrylic, aproximately half the skein. Wool for a fuzzy brushed Googly Thought cozy. Satin Ribbon I used Weather Resistant Basic Floral Satin 5/8″ in white. Super Glue or Fabric Glue I used Gorilla Glue. Fabric Glue doesn’t always keep things stuck but Gorilla Glue does. Sticky Back Velcro I used the General Purpose 3.5″ x .75″ white strips and cut them in half. Optional: Additional Novelty Ribbon I used a Black 5/8″ ribbon with little round hollogram rhinestone looking things on it. 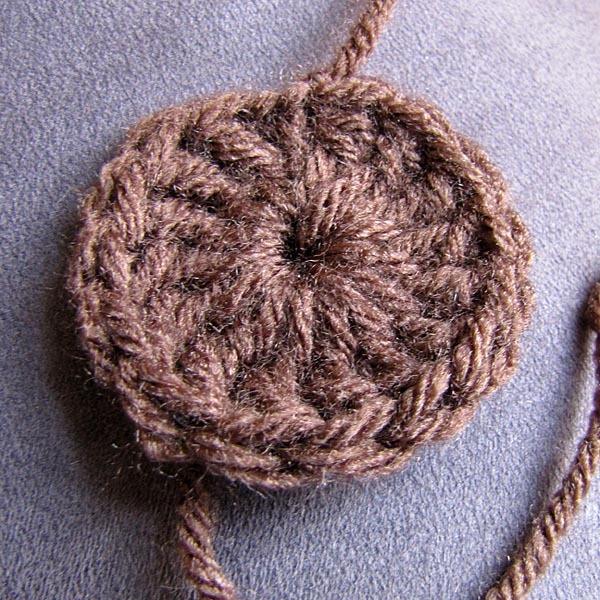 You will be crocheting in the round and will not turn. 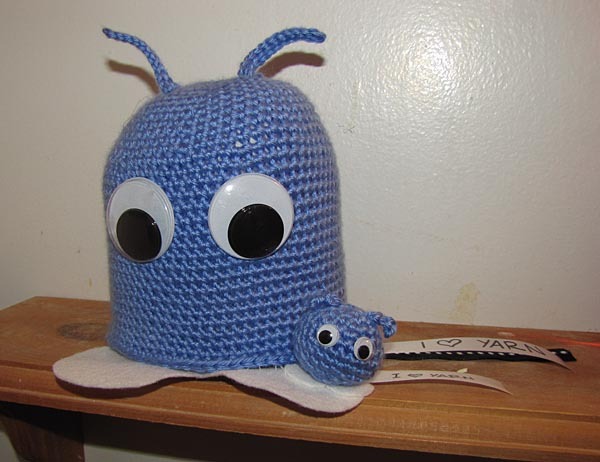 This is an amigurumi style TP Cozy. Repeat what is listed between the () where instructed. Optional: If you are using wool and want a fuzzy cozy, brush the wool hard with the dog brush. If you’re looking for more info on this check out Roxycraft’s tutorial. 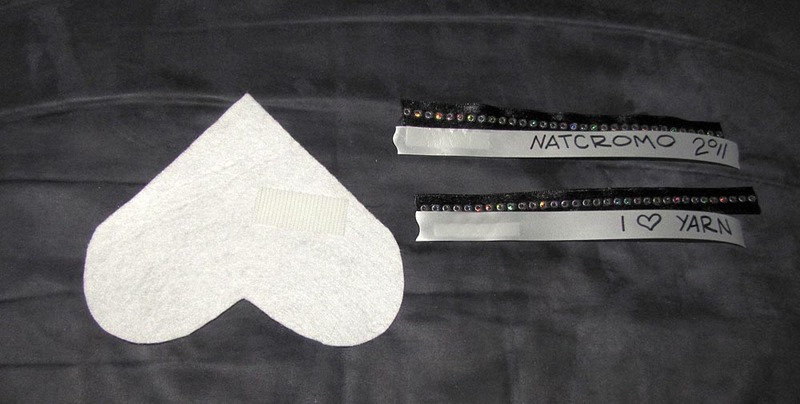 Cut the felt feet into the shape of a heart. Mine measured 5.5″ high x 6.25″ wide. 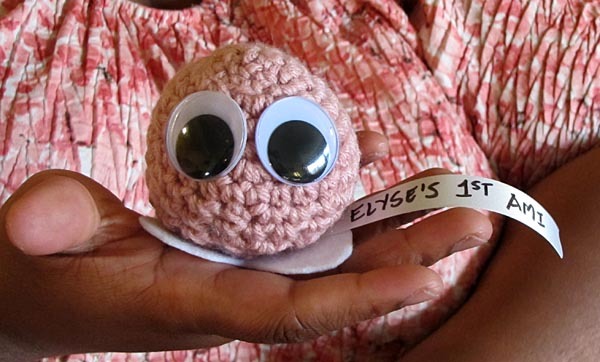 Using fabric glue or super glue, glue the eyes to the cozy. Figure out where you will place the ribbon on the feet. Remember the Cozy will be on top of it, so the words should start beyond the edge of the feet. Stick one side of the Velcro on the feet and the other on the ribbon. This will allow you to change the messages on the cozy. 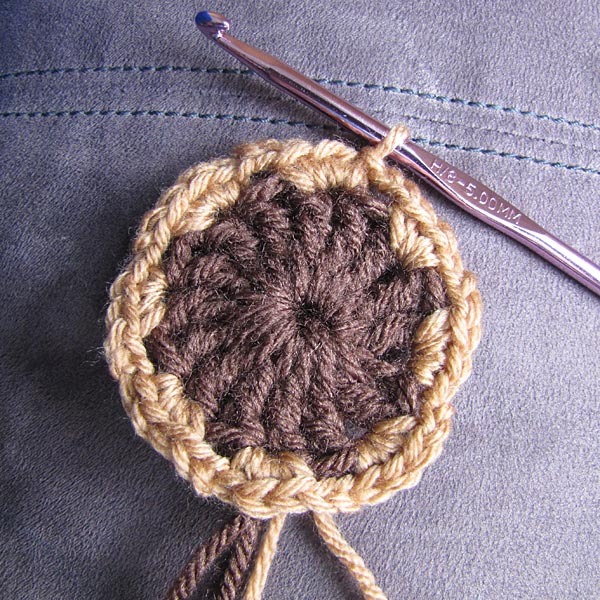 Sew the just front part of the cozy to the feet with a regular needle and thread. Either tack it on or sew a few inches. 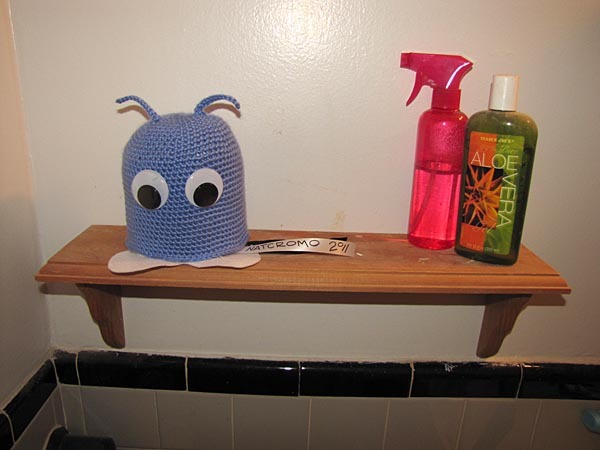 Start the roll of toilet paper and stuff a little in the top of the cozy to make the head round. Insert the roll of toilet paper. You’re done! Now come on over and join the NATCROMO party, you did just finish your first task in the Scavenger Hunt. While I purchased wider ribbon in 7/8″ and 1.5″, I was unsuccessful in my attempts to write on them. They were both Celebrate It brand Basic-Basic. Sharpies bled, my gel pen was M.I.A., and my tube of fabric paint just wasn’t working with me and kept getting uneven and ugly. I finally used my Sharpie on the 5/8″ ribbon I had from the original Googly Thoughts and life was good again. That was Basic Basic Floral Satin Weather Resistant Ribbon. In other lessons learned, since it’s weather resistant, when I wrote on it with a gel pen, it wipes right off, so use a Sharpie. I’m also thinking when it comes to writing on ribbon, I have a lot to learn. I’d love to hear some tips if you have had some success with it.